Why are there so many Starbucks in Dublin right next to each other? 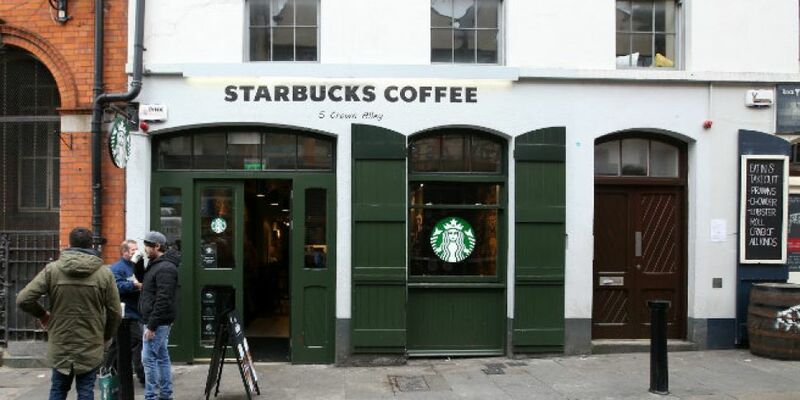 Starbucks has opened its second store in Rathmines, Dublin 6 - 200m south of the outlet on Rathmines' main street. There are a number of locations around the city where Starbucks appear in pairs and clusters. The most obvious example being Westmoreland St, right in the centre of the city where the company's cafes are only separated by the passing traffic. Some 180m across O'Connell Bridge there's another Starbucks coffee shop, and another just over 200m further up that street - this is part of a cluster of three within spitting distance of each other. Unlike other similar brands, Starbucks centrally owns its coffee shops - they are not independent franchises so it doesn't need to worry about cannibalising demand in the same way that other brands do. In a previous statement on this issue, the company said that it, "takes a thoughtful and strategic approach when choosing our store locations, carefully considering many factors including community demand. We are always looking for great locations to both better meet the needs of our current customers and to reach new ones." While some patrons might feel that coffee is a daily essential, in reality, it's a small luxury - with many of the beverages on offer in Starbucks leaving little change from a fiver and convenience can be a factor. Asking customers to cross Westmoreland St could mean lost sales as potential customers get on with their days or keep walking until they reach an Insomnia or Costa. Starbucks has built itself into a global phenomenon - giving it the financial clout to hoover-up favourable locations. This has a number of benefits for the company, it means that a competitor is not opening next to an established store, and it also means shorter wait times for customers in areas where the company already knows that there is strong demand for its product. Not everyone is thrilled at the spread of the US giant across the city. A number of people have objected to the recent opening of a Starbucks on Drury Street in the city centre. Councillor Mannix Flynn is among those who have raised concerns about the southside outlet, he objects to both the signage, and the retail unit's use. It was previously occupied by an independent men's clothes retailer which also operated a small cafe. Mr Flynn has said that there should have been a period of consultation between locals before the opening of the cafe was approved. Once Dublin City Council (DCC) receives such a complaint it is required to examine the concerns that have been raised. "Dublin City Council can confirm that this operation is under investigation following complaints received about signage and change of use of the building," the DCC confirmed in a statement. DailyEdge recently surveyed the capital's independent coffee owners regarding the rapid popping up of mermaid-branded cafes, but they don't seem to be too bothered, most make a distinction between what they offer and what Starbucks bring to the city. As Karl Purdy from Coffee Angle put it, "As you can imagine their coffee doesn’t suit my palate… but the world would be infinitely less interesting if we all liked the exactly the same things." Although Dairine Keogh, the owner of the popular South William Street coffee shop Clement & Pekoe did raise concerns about these bigger players moving in and adding to market pressures pushing rents up. "The stark reality is that big chains can drive up rents to a point where these great businesses can’t compete ... Should the decision of what lies ahead be solely left in the hands of landlords looking for the highest rent possible?" she wondered.